He will do best in a home with children" parting words from an owner whos personal problems were more important than this boys life. What a good boy he is too - Sparty lived with TEENAGERS, loves to play with small and large breed DOGS, and e is friendly/outgoing towards EVERYONE he meets. Today will be the end to a beautiful life unless someone opens their heart to him. NOT RESERVED - THRASHER WILL BE KILLED ANY MOMENT (if not already) - Miami-Dade Animal Services. 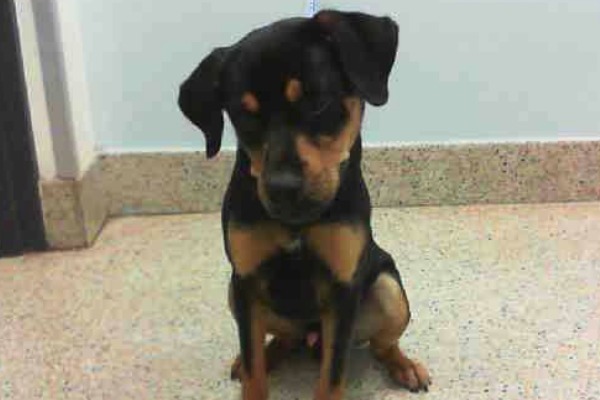 I am a male black and tan Rottweiler mix. The shelter staff think I am about 9 months old and I weigh 34 pounds. I was turned in by my owner and I am available for adoption. Thrasher is a wildly adorable young lad and, boy, does he know it. He waits for me quietly in his kennel, looking up ever so slightly, a twinkle in his eye, and a “see how calm and patient I am?” expression across his face. Naturally I fall for it hook, line, and sinker ... The moment the leash is off he “unleashes” his inner puppy, launching into jumps, dives, and squeals, pushing his silly paws against my legs and chest like we’re two children on a playground. “Play, come on PLAY!” he demands. And while I can’t help but feel a little tricked by sweet Sparty, I also can’t help but be swept away by his joyous charms. Later on, when some delicious treats appear on the scene, I learn that Thrasher has had some training in his short life. “Sit,” “stay,” and “come” are all firmly in this boy’s vocabulary and each one is rewarded with a lip-smacking snack. I run my hand along his fluffy, ebony coat and marvel at how thick and full it is. This boy has been well cared for. He has certainly known love."